The X-Men line has the curious distinction of receiving the most Omnibus-Sized hardcovers from Marvel but those books not being actual omnibuses. Even when the solicitation text refers to an X-Men Oversized Hardcover as an omnibus, they aren’t officially titled as omnibuses nor do they carry the omnibus trade dress. 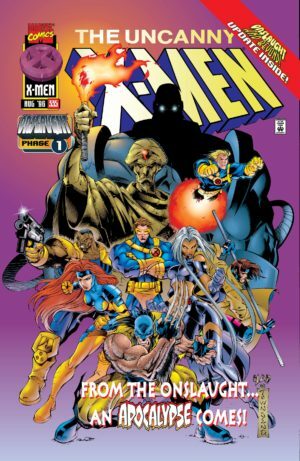 The only exceptions in this era are the Onslaught omnibus and X-Men: Revolution by Chris Claremont. Collects Uncanny X-Men (1963) #281-293 and X-Men (1991) #12-13, plus backup stories from #10-11. Annual 16/1992: Not collected in this format. Falls between #287-288. Collects the entire crossover: X-Factor #84-86, Uncanny X-Men #294-296, X-Force #16-18, and X-Men #14-16 – plus epilogue issues Uncanny X-Men #297 and Stryfe’s Strike File (1993) #1. A massive collection focusing on the core of the Fatal Attractions story from Uncanny X-Men and X-Factor. Collects Uncanny X-Men #298-305, 315, & Annual 17; X-Factor #87-92; X-Men Unlimited #1-2; X-Force #25; X-Men #25; Wolverine #75; & Excalibur #71. (Annual 17 comes between #300-301). While this hardcover is titled after the wedding in X-Men (1991) #30, in terms of what it collects from Uncanny X-Men it could more aptly be titled “X-Men: Bloodties.” Collects X-Men (1991) #26-35, Avengers (1963) #368-369, Avengers West Coast (1989) #101, Uncanny X-Men (1963) #307-310 & Annual 18/1994, Cable (1993) #6-8, X-Men Unlimited (1993) #3, X-Men: The Wedding Album, What If? (1989) #60, Adventures Of Cyclops and Phoenix #1-4, and material from Marvel Valentine Special. #315: See Fatal Attractions, above. Collects all but two issues of the original Age of Apocalypse Saga! Contains Uncanny X-Men #320-321, X-Men (1991) #40-41, Cable (1993) #20, and all of the original Age of Apocalypse issues except for X-Men Chronicles #1-2. Reprinted in 2016. Collects Generation X #26-31, Cable #45-47, X-Men #65-70, X-Force #67-70, Uncanny X-Men #346, Wolverine #115-118, and X-Man #30. Begins in October 1991. 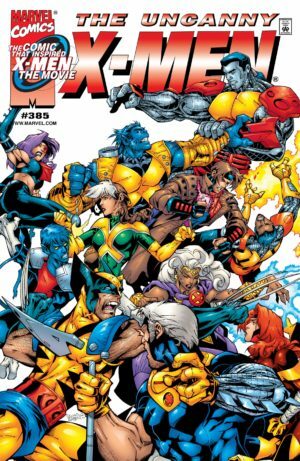 Though X-Men #1 was released at the same time, the story in X-Men #1-3 precede this era, while X-Men #4-5 happen at roughly the same time at the story in issue #281. This period begins roughly simultaneous toX-Factor #71, X-Force #1, Wolverine #47, and Excalibur #55. These issues begin with a high-casualty battle at the Hellfire Club, which continues to have ramifications to this day in the story of Emma Frost. We are introduced to Bishop during the battle. The beginning of this era is penned by John Byrne with beautiful art by Whilce Portacio and inker Art Thibert. Scripting duties transfered to Scott Lobdell at the end of the initial Bishop story, along with Portacio and a gallery of inkers. At X-Cutioner’s Song Brandon Peterson takes over pencils with a style that marries Jim Lee and Portacio. John Romita Jr. continues pencils starting with issue #300. Also includes excerpts of 284-285 and 287. A single issue reprint. Also collects Uncanny X-Men #266 (Gambit’s first appearance) and X-Men (1991) #8 (Gambit & Bishop’s first meeting). Annual 16/1992: Not collected in this format; part of the “Shattershot” Annual crossovers. Falls between #287-288. Also, see Marvel Universe Events. Infinity War: See Marvel Universe Events. This occurs between #290-291 for the X-Men. No X-Men title ties in directly with Infinity War. Collects the entire crossover: X-Factor #84-86, Uncanny X-Men #294-296, X-Force #16-18, and X-Men #14-16 – plus epilogue issues Uncanny X-Men #297 and Stryfe’s Strike File (1993) #1. Previously collected in an out-of-print paperback (minus the epilogue issue, and with some printing errors). Collects Uncanny X-Men (1963) #298-300, 303-304, & 315, Wolverine (1988) #75, X-Factor (1986) #92, X-Force (1991) #25, X-Men (1991) #25, and X-Men Unlimited (1993) #2. May also collect Excalibur (1988) #71. A 1994 paperback collected only the hologram cover issues of each title. This brief sequence of issues navigates a stunning four crossovers (although, technically Fatal Attractions is a standalone issue). After some fill-ins, it starts with pencils by John Romita, Jr. and ends with a restrained early run of issues by Joe Madureira. #301-302: Not collected in this format, though it is in oversize format above. Though they weren’t all released in the same month, effectively the story that kicks off this era runs in order through X-Factor #92, X-Force #25, Uncanny X-Men #304, X-Men #25, Wolverine #75, and Excalibur #71. #305-306: Not collected in this format, though it is in oversize format above. This is a Marvel Premiere Edition hardcover, which is Marvel’s “budget” line of normal-sized HCs with lower production quality. Collects Avengers #368-369, Avengers West Coast #101, X-Men #26, Uncanny X-Men #307, & Black Knight: Exodus. Previously available in an out-of-print softcover sans the Black Knight one-shot as Avengers/X-Men: Bloodties (ISBN 0785101039). 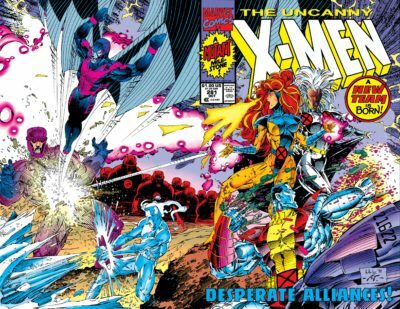 A paperback collecting X-Men (1991) #27-30 & Annual 2; X-Men Unlimited (1991) #3; Uncanny X-Men #308-310 & Annual 18; X-Men: The Wedding Album; and What If? (1989) #60. Annual 18 occurs between issues #309-310. #311-314: Not collected in this format, though it is in oversize format above. The crossover that launched Generation X. Collects “Generation Next” from Uncanny X-Men #316-317 and X-Men #36-37, “Life Signs” in X-Factor #106, X-Force #38, and Excalibur #82, “Final Sanction” in Wolverine #85 and Cable #16, and Generation X #1. The “Generation Next” crossover that launched Generation X; collects Uncanny X-Men #316-318, X-Men #36-37, Generation X #1-4, and Generation X Ashcan Edition. Buyer beware! A paperback with incredibly low reproduction quality on newsprint paper. It’s unclear on whether this collects the entirety of these three issues, or just portions relevant to the crossover. Collects X-Factor #108-109, Uncanny X-Men #319-321, X-Men#38-41, Cable #20, and X-Men Age of Apocalypse Ashcan Edition. Previously collected as Legionquest (ISBN 0785101799) just with the Uncanny issues and X-Men #40-41. Begins July 1995, parallel to X-Men #42, X-Force #44, X-Factor #112, Wolverine #91, and Excalibur #87. X-Man continues out of Age of Apocalypse with issue #5. Almost the entirety of this run is the work of Joe Madureira, aside from scattered art fill-ins. Madureira’s art is considered classic, but gets more and more cartoonish as his run continues – emphasized by the garish comics coloring of the 90s. Gambit and Rogue are featured heavily in this sequence. Collects Uncanny X-Men (1963) #329-332, Archangel #1, X-Men/Brood #1-2, X-Men Unlimited (1993) #10, X-Men #50-52, Wolverine (1988) #101, and the Xavier Institute Alumni Yearbook. Archangel and X-Men/Brood #1-2 directly follow #328 and occur prior to #329 or X-Men #50. #333-337: Variously collected in paperback as part of Onslaught. See Marvel Universe Events for collection information. This run is notable for frequently treating Uncanny X-Men and X-Men as bi-weekly editions running a contiguous story. Collects Uncanny X-Men (1963) #338-340 & Annual 20/1996 and 21/1997; X-Men (1991) #58-61 and Annual 1997; X-Men Unlimited (1993) #12-14, and X-Factor (1986) #130. The 1996 annual falls at the beginning of this run. #338-340 cross over to X-Men, Vol. 2 #58-59. The 1997 Annual follows #340. Collects Uncanny X-Men (1963) #341-350 & -1 and X-Men (1991) #62-64 & -1. UXM #343 falls just before Generation X #26. Issue #-1 was released between #345-346, but occurs entirely in flashback. Collects Cerebro’s Guide to the X-Men (1998) One Shot, Uncanny X-Men (1963) #351-359, Uncanny X-Men/Fantastic Four ’98 (1998) Annual 1998, and X-Men Unlimited (1993) #17. Issues #351-355 cross over to stories in X-Men (1991) #71-75. Issue #358 contains elements that result from events in X-Men (1991) #77-78. 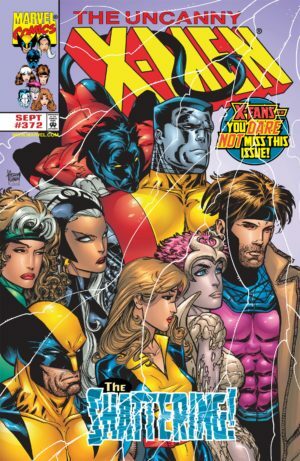 The annual occurs after #359; all 1998 annuals were team-up books. Collects Uncanny X-Men (1981) #360-365; X-Men (1991) #80-84 & 1/2; X-Men Unlimited (1993) #22. Issue #360 crosses over with X-Men (1991) #80; #362-365 cross over with #82-84. A bumpy period of mini-crossovers, including the return of Magneto, the X-Men disassembling themselves, and a long-awaited (but quite tepid) encounter with Apocalypse. Collects Uncanny X-men (1963) #366-371, X-Men (1991) #85-91 & Annual 7/1999; X-Men: The Magneto War #1; X-Men Unlimited (1993) #23 and material from #24; and Magneto Rex #1-3. Issues #366-367 are a direct crossover with X-Men #85-87; issues #368-371 cross over to X-Men (1991) #88-91. The annual does not take place until after #377. Collects X-Men #85-87, and Uncanny X-Men #366-367, Magneto Rex #1-3, and X-Men: Magneto War #1. 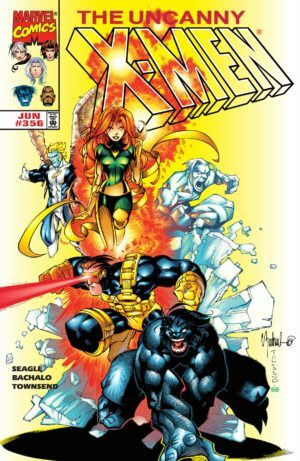 Collects Uncanny X-Men #372-375, X-Men #92-95, Astonishing X-Men (vol. 2) #1-3, and X-Men 1999 Yearbook. 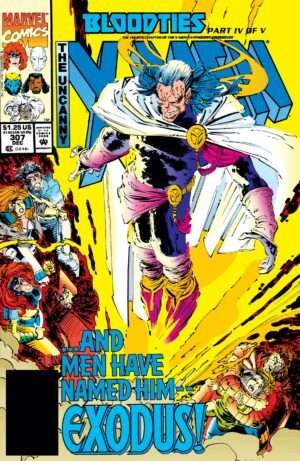 There’s also the out-of-print The Astonishing X-Men: Deathwish (Apocalypse The Twelve Prelude), which collects the smaller range of X-Men #92, Astonishing X-Men #1-3, Uncanny X-Men #375, and X-Men #95. Collects X-51 #8, Uncanny X-Men #378 and Annual 2//1999, Cable #77, Wolverine #148, X-Men Unlimited #26, X-Men #98, and X-Men: The Search for Cyclops #1-4. Collects Uncanny X-Men #379-380, Cable #78, X-Force (1991) #101, Wolverine #149, and X-Men #99. Chris Claremont returns to the X-Men 100 issues after his departure for “Revolution.” This story is notable for introducing a six month gap in continuity to allow for Claremont to imply some mysteries, including why Jean and Psylocke have switched powers. #381-383: Not collected in this format, though it is in oversize format above. Part of the Revolution linewide relaunch. 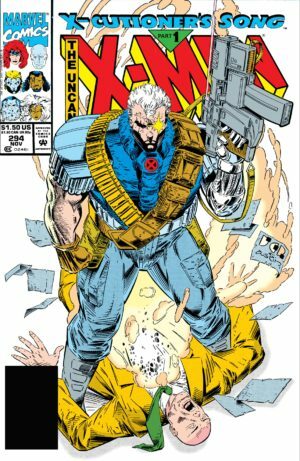 Runs parallel to X-Men (1991) #100-102. #386: Not collected in this format, though it is in oversize format above. A massive paperback collecting Maximum Security: Dangerous Planet, #1-3, Captain America (1998) #36, Thor (1998) #30, Uncanny X-Men #387, Bishop: the Last X-Man #15, Iron Man (1998) #35, Avengers (1998) #35, Gambit (1999) #23, X-Men (1991) #107, and X-Men Unlimited (1993) #29. 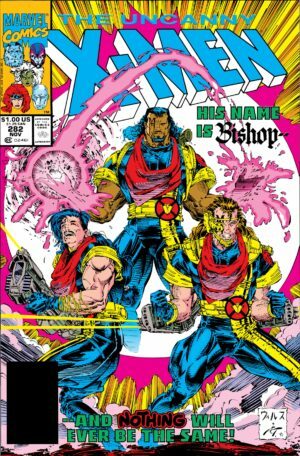 Collects Uncanny X-Men #388-390, Cable #87, Bishop #16 and X-Men #108-110. Annual 23/2000: Not collected in this format. Occurs around the end of the Dream’s End issues, just prior to UXM #390. Collects Uncanny X-Men #391-393 and X-Men #111-113.